THE SPOTTED HARE: Out with the old....and IN with the OLD !! Out with the old....and IN with the OLD !! I am in the midst of a TOTAL studio re-design. Have you ever been swayed or influenced by a style or color that over time you found just was not you? Well.... it happened to me tho I'm not sure how . . . it crept in one sneaky piece at a time. One day I looked around and my whole studio was "white". Now...it was lovely, don't get me wrong...very pretty in fact, but it just was not me . . not in my heart and soul! Sooooo . . . 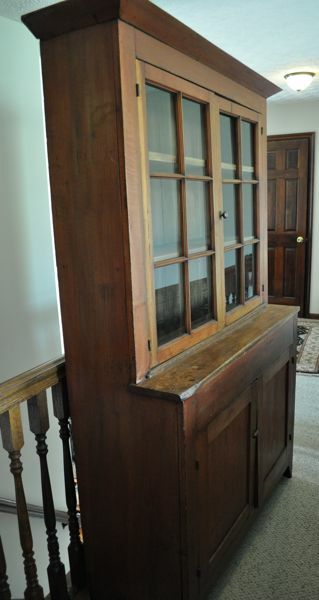 I had been wanting to tackle this for so long, but it took a wonderful antique cupboard to set me on my path! Here are a few sneak peeks and the "before" photo. The main culprit in this insanity is the antique cherry step back cupboard. We found it in Berlin, Ohio . . . it called to me for weeks before we went back for it,since it was still there, it was meant to be mine! 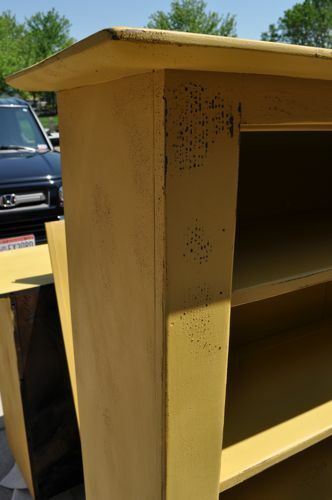 The Mustard paint on a cupboard you see . 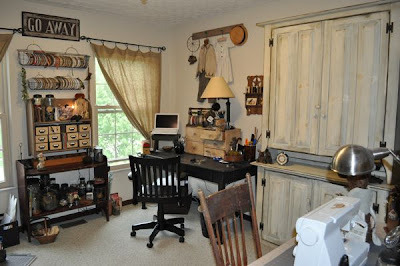 . . was once the big white cupboard in the before photo and the red drawers were once the white drawers on my worktable! Yes, I've been covered in paint and stain daily! Enjoy . . . . eventually I'll have an "after" photo!! ...Great job - can't wait to see it finished! I love your studio. I wish mine could look like that. Maybe that's something else for me to do. 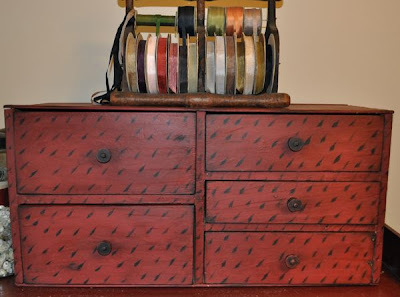 Love those drawers! are those spools being used as knobs??? The work so far is wonderful! I'm loving the new colors. Wow, Lori Ann, lucky you! That is one GORGEOUS cabinet! You know how I am seriously head-over-heels in love with a good looking cabinet! How did you get that beast up the stairs??? P.S. Love your "Go Away" sign too! Love that cabinet and I can't wait to see it all redone, the room I mean!! The new studio might stay neat and orderly for maybe...... a week (while I shoot pictures!) then chaos will reign once again! Kris . . . luckily we were able to have this cupboard delivered so I smiled really big and asked them to carry it up the stairs! Bless them! Lori, I just love that cupboard!! You should tell me when you're coming up again and we could meet up! !